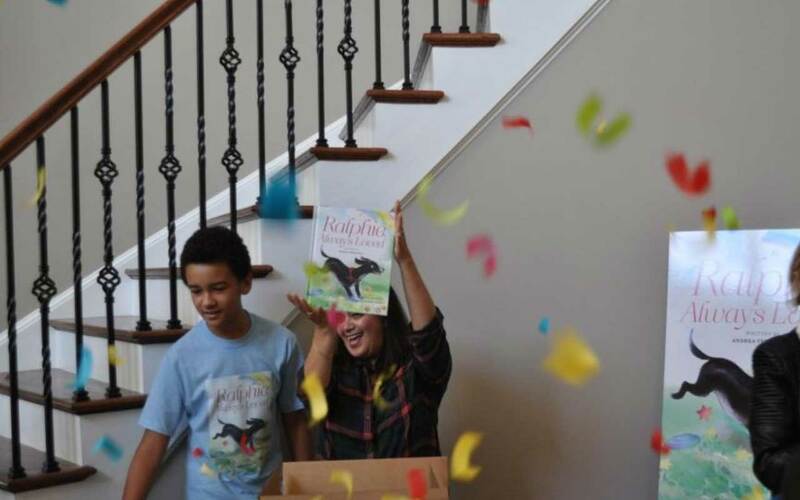 First time Author, Andrea Yerramilli, launched her book Ralphie, Always Loved on October 28, 2017 at a private launch party in her home. She was surrounded by 68 friends and family who knew and loved Ralphie and who have been supportive throughout the writing and publishing process. The party started at 3 pm and went till about 7 pm. Guests mingled, talked, and enjoyed delicious food catered by Market Roost in Flemington, New Jersey. http://www.marketroost.com/ Andrea spoke briefly to her friends and opened a box of books. Confetti showered down and Ralphie, Always Loved was officially introduced to the world. Gisele Jacobson, a family friend, read the book aloud to the guests, many who were seeing it for the first time. Andrea smiled and signed books like a mini celebrity! ☺ Andrea and her friends raised $250 dollars for the Animal Rescue Force, the Rescue that Ralphie came from. Andrea is looking forward to her first scheduled, public book signing at the Market Roost Café in downtown Flemington on November 18th between 2 and 4 pm. Ralphie, Always Loved wins Mom's Choice Award. Honoring excellence in family-friendly media, products and services. Gold Award Recipient. The Nautilus Awards celebrates Better Books for a Better World. It's #PitMad today! I'll be keeping an eye on #PB! ♥️ = submit according to our children's guidelines: pagestreetpublishing… Please include the event's hashtag & my name in the email subject line if you get a ♥️ from me. No child should be separated from their parents. But if you’re going to take tired, hungry children from their mothers’ arms, you better know how many you took and where they are. @DHSgov Sec. Nielsen doesn’t seem to care to know. Nothing less than her resignation would be just. President Barack Obama declared a national emergency in 2009 during the swine flu outbreak. President George W. Bush declared a national emergency the day after the 9/11 attacks. Those were national emergencies.